WHILE READING A Tropical Place Like That: Stories of Mexico by Baker H. Morrow, Studs Terkel celebrated his ninety-fifth birthday with a radio interview. He talked about counting: we all count. Morrow must prescribe to the same school of thought because his collection of short stories reminds us that the simplest pleasures are worth remembering. We are treated to whittled essences of another country, another age. 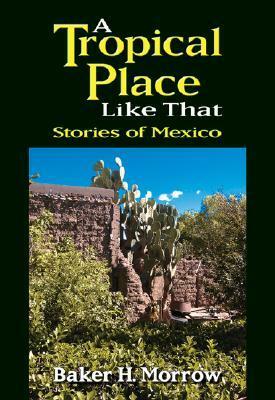 Each story takes place in Michoacan, Mexico. The first impression is the almost total absence of electronic contraptions. There is no mention of fax machines, computers, I-pods, televisions, radio, and almost no mention of telephones. When describing travel, the characters drive extinct models of pickup trucks, coal fueled trains, and diesel fueled miniature buses. Morrow describes places in Mexico from nearly one half century ago and the absence of distractions combined with the formality of Mexico’s poor is a wonderful mirror. Just as Mexico has changed, so we have. Yesterday’s curious gabachos and gabachas like Morrow’s wandering Lou Becton and Annabelle Scott, who travel long and hard to simply learn another language and meet our neighbors, have been replaced by a new generation of American youngsters who jet to Mexico’s beaches for segregated drunken orgies. The only Spanish spoken are the words, “¡Más margaritas!” shouted at uniformed, English speaking Mexican servants. Morrow remembers something different: American children of the Greatest Generation who, like Atlanteans, set out to rediscover the smoldering post Second World War earth. Morrow is, after all, of the Kesey generation and like Kesey, was most definitely on the bus. The eleven short stories are summarized accurately on the back cover which describes “the ghost of a church and its residents (who) create an eerie home that never should have been, spectral white tracks of a burro train, and a humble tire repairman and his wife (who) want children too much . . ..” What it omits is comment upon Morrow’s style. He has avoided the concept of good and evil and in so doing, dares the reader to join this rediscovery. It is the little boy sleeping in many a grown man you might call sensible. His stories become even more poignant for the art of remembrance spawns reflection while melodrama is barren. Although a work of fiction (artfully told lies) the stories reminded me of Zen in the Art of Archery, written by a German philosophy professor who lived in Japan during the 1930s. Morrow’s stories (possibly by coincidence) emphasize the sights, sounds, and feel of tiny villages, springs, leaky rowboats, and more. The treatment of man as a part of nature is, of course, a common tenant in Zen literature, as are the absence of the rational (good/bad), and the enjoyment of pleasant thoughts. These stories are pleasant moments which serve as epiphanies to larger truths. Morrow has created Literature for us folks.